It's time.....for my very first link party!!! 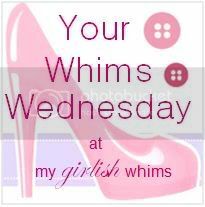 I show off my girlish whims weekly on my blog, and now I want to see yours! Please add my button (code above) to either your blog post or somewhere on your blog. And, if you take time to comment on a few other entries, that would be awesome, because we all love comments!! I'd love if you would follow me as well --after all you want to see if you get featured cause I made a really cute featured button you could show off!! I'll do a features post next Wednesday. Happy linking!!! Great link-up...I'm adding your button to my sidebar since I linked to an old post! You are TOO cute! Thanks for inviting me, I am posting the tute up now! Thanks for inviting me. And now you have a new follower. Thanks for introducing me to your blog--I'm loving it! Thank you for the invitation, I am linked up and following, I love meeting new people. Thanks for hosting this awesome linky!! :) I added my DIY coasters. I'm also giving a set away so if you'd like to win just hop on over. I added you to my linky schedule so I hope to see you every week!! Thanks for inviting me along and hosting!!! I'm a new follower! I love your blog! Thanks for hosting! Thanks for the invite. I love your blog and am now a follower. Thanks for inviting me! I'm always down for a new link party - especially a girly one!! Hi Rebecca - Thanks for visiting my blog. I joined your linky party. Your blog is adorable and so are you! Thanks for the invite and hooray for a new link party! I posted my wheat grass tutorial and a few other projects. I've joined your party! Thanks for hosting. Your blog is adorable! Thanks for inviting me over here! Fab blog! Hooray for your first link party! Thanks for inviting me, as a mother of 3 boys (and a girl) I do like your girly blog! I will be a new follower, thanks for visiting my blog http://annekids.blogspot.com ;-). Congrats on your first link-up party!! I'd really like to host one in the near future. Maybe you can give me tips from your experience. Thanks for visiting my blog and suggesting the link-up and hello from your newest follower. Thanks so much for stopping by my blog and for the sweet comment on my skirt refashion! I'm super happy to link up to your party! Thanks for hosting, looks like you had an awesome turnout for the first time. =) I will definitely be back! Thanks for having me! Excited for your first partay!! Thanks so much for inviting me!!! I have added your party to my Parties page and I am your newest follower. I'm your newest follower; sorry I missed your party, I'll be ready next time. Great showoffs!